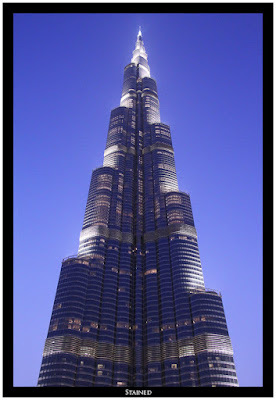 No matter how big or small your ambitions are; constant fortitude to achieve them is the best way ahead. In other words, baby steps are being taken, three more things done. Each step chipping off the person I don’t want to be and taking me closer to you. SJ managed to at last bully me to go to Wildpeeta on the 25th. She’s been trying for ages to get me to eat there to break my immature resolute and help me get over this mental obstacle. In the end I’m just glad that it was with her I ended up going and not for some tweetup. The food tasted okay but it’s over priced for the size of the meal or the taste. 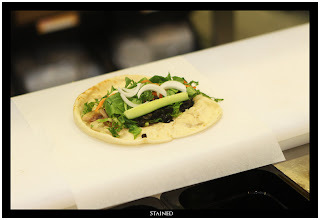 Anyway that’s a shot of my fusion shawarma being made. SJ got me the Italian one and I had some orange juice as well. 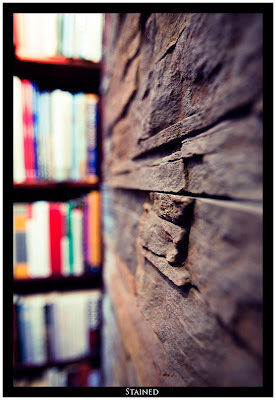 After shooting some portraits, grabbed SJ's 5D and had some fun with short depth of field & an ultra wide angle lens. A Brilliant concept with a 'playing it safe' execution. Not taking anything away from Christopher Nolan who has done a great job directing and writing it but the movie didn’t seem to push the envelope for me. It could have been so much more but it chose to be a simpler version to make it more profitable (I assume) in the sense that by making the movie less complicated, they ensured that the movie goers were enthralled by the ride they were taken on while it almost managed to stay logical to most of them. Making someone else believe the idea in their head is theirs is something you can do without getting into the persons dream. 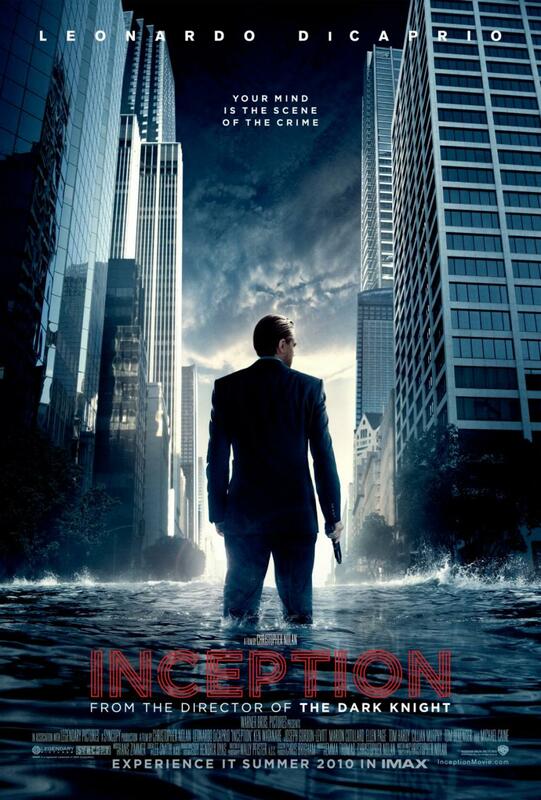 But in Inception, dreams are used as the doorway to manipulate the mind, to plant thoughts or reveal secrets. The concept of a dream in a dream in a dream was like pealing an onion, one layer at a time. Watching that was magical in its own mental way. With such a head scratching, mind boggling concept; the cast seems to have taken somewhat of a back seat. 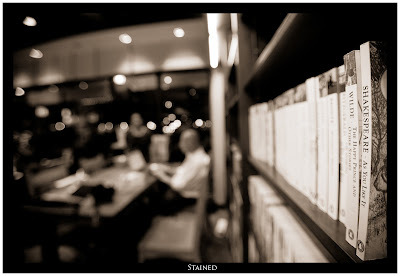 There was no stand out performance; all of them played their parts to mechanical precision. Leonardo DiCaprio plays Cobb, the almost know it all with a haunted past that revolves around his dead wife, Mal (played by Marion Cotillard). He seemed to have sleep walked through most of the movie, it almost felt like a controlled performance with few sparks of brilliance here and there. Joseph Gordon-Levitt, Ellen Page, Tom Hardy, Ken Watanabe, Dileep Rao, Cillian Murphy and the rest of the supporting actors rallied well around him with over shadowing each other. Christopher Nolan is now being called a genius behind the camera which I somewhat agree with. This might not be a brilliant movie I was expecting it to be but whatever that was created was well executed and spectacularly delivered. 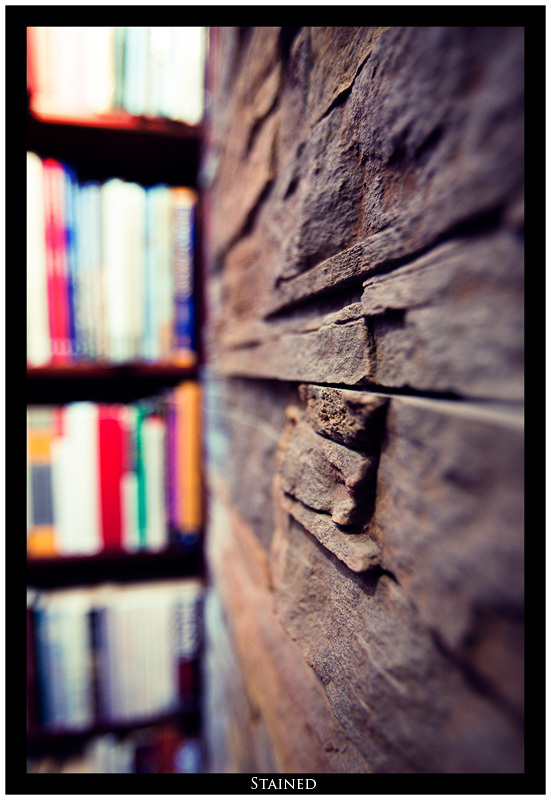 He has managed to make a complicated concept look interesting without making it boring which is a tough thing to do. The visual effects were smartly and creatively done while the action sequences were unique and the process by which they intertwined with each other was refreshing to see. The cinematography was stunningly done complimenting the action flawlessly and the music score was just outstanding. 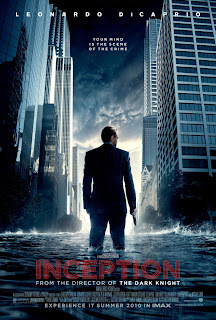 All of this together makes Inception an exhilarating experience that tops anything I’ve seen this year by a long shot. Chris Melandandri, the executive producer who bought us Ice Age: Dawn of the Dinosaurs and Horton hears a Who, brings us a new animated movie in the form of Despicable Me. 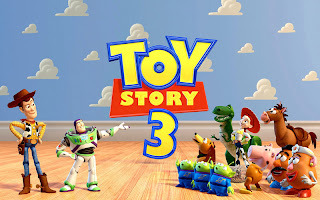 I hadn't heard of this movie until I saw the trailer when I'd gone to watch Toy Story 3 (Review here). It looked interesting but didn't tickle my curiosity enough to make me want to go to the theater to watch it. Then on one lazy Friday night, me and my siblings decided to go watch a movie and Despicable Me was the only one that fit the bill as my 4 year old niece was to accompany us. A late night show, the theater was full of easily tickled idiots which meant it wasn't the best environment to watch an average movie. 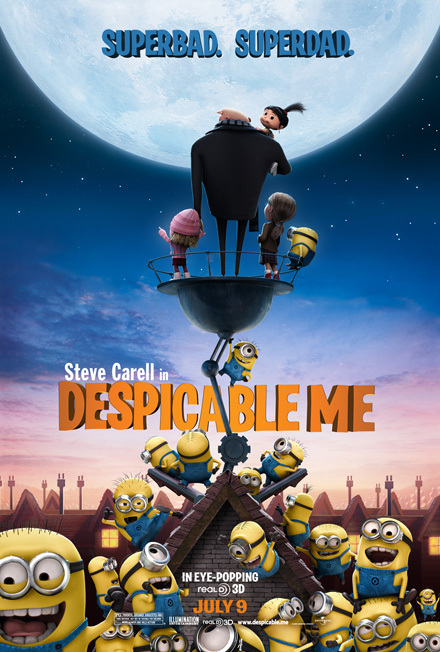 Stealing the moon, the greatest heist ever destined to make Gru (voiced by Steve Carell), with the help an aging scientist Dr. Nefario (voiced by Russel Brand), and an army of minions (voiced by directors Peiere Coffin and Chris Reneud, and Jermain Clement), the world's greatest villain. But before all of that, he needs a loan from the 'Bank of Evil' (formerly known as Lehman Brothers) run by Mr. Perkins(voiced by Will Arnett) who happens to be Vector's (voiced by Jason Segel) father, the new villain on the block and Gru's arch nemesis who had stolen the Great Pyramid of Giza to become the world's current greatest villain. In order to achieve his goal, Gru adopts three orphans, Margo (voiced by Miranda Cosgrove), Edith (Dana Gaier) and Agnes (voiced by Elsie Fisher) who after an initial edgy period falls in love with them. I won't go more in detail and spoil the fun for the readers so that's enough of a spoiler. The story was humdrum in most places which is generally the case with animated movies but the problem with Despicable Me is the lack of any stand out characters. Apart from Gru, the minions and Agnes, the rest of the characters were a little *done to death*. Some of the human gags fell flat while the emotional moments were cute in patches (basically Agnes was the only one who shined). The minions were by far the best element/s of the movie which made it an almost above average movie. Their almost gibberish talk, funny antics and innocence was refreshing. Possibly a movie I wouldn't have preferred watching in the theater but I wouldn't call it a waste of money either. It was a feel good movie that doesn't leave a bad taste in your mouth later (if that makes any sense). Instead you choose to walk away to let that moment pass. Odd isn't. What does that mean? A movie that is trying to be a comedy and an action movie at the same time can go wrong in a lot of ways and unfortunately 'Knight and Day' was one of those movies that went horribly wrong in almost every possible way. Directed by James Mangold whose last directional venture was '3:10 to Yuma' (a movie I liked a lot), it was disappointed to see this quality of work coming from him. The problem does not lie with the concept which revolves around a secret agent Roy Miller (played by Tom Cruise) who's being hunted by his own agency because they believe he has gone rogue while he tries to clear his name, James bond style. His love interest is played by the completely ordinary June Havens (played by Cameron Diaz) whose character revolves around being the damsel in distress who gets saved by Roy Miller every single time. Now this has been done a million times over and can still be successful on an average level if executed well which is surely not the case here. 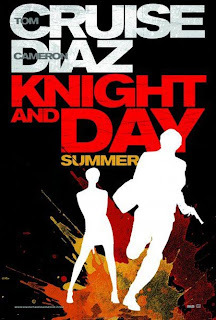 The problem with 'Knight and Day' is the lead cast. Tom Cruise is old, and just because he manages to extract some abs out of his tummy at this age does not change the fact that watching him doing stunts that you would expect a much younger actor to do is a little implausible. Cameron Diaz on the other hand looked older than she has in any other movie that I've seen of hers and very tired. I don't know if it was the makeup or the lack of it but it does remove the slight quirky edge out of her character. Then there was the chemistry. It was hard to watch them romance each other in ways you'd expect 20 something people to do. It was mid life crisis on the big screen or something along those lines and it didn't look good. And then there was the feeling that this was just Mission Impossible 4 for Tom Cruise with a bit of comedy thrown in it. Mission Impossible 3 was bad enough, this one just felt worse. Also the lack of any substantial support characters didn't help either nor did the jokes that fell flat most of the time and just got half hearted laughs from most the crowd. Even the CGI was poorly done. The only saving grace was some of the action was nicely executed while Tom Cruise was good in patches. Even Cameron Diaz managed to save some face at the end when she managed to play the part of being drugged by a truth serum convincingly. In the end, I honestly regret going for this movie in the theatre. We used to call him Jungly for no apparent reason apart from the fact that he was a street cat, not a stray though. 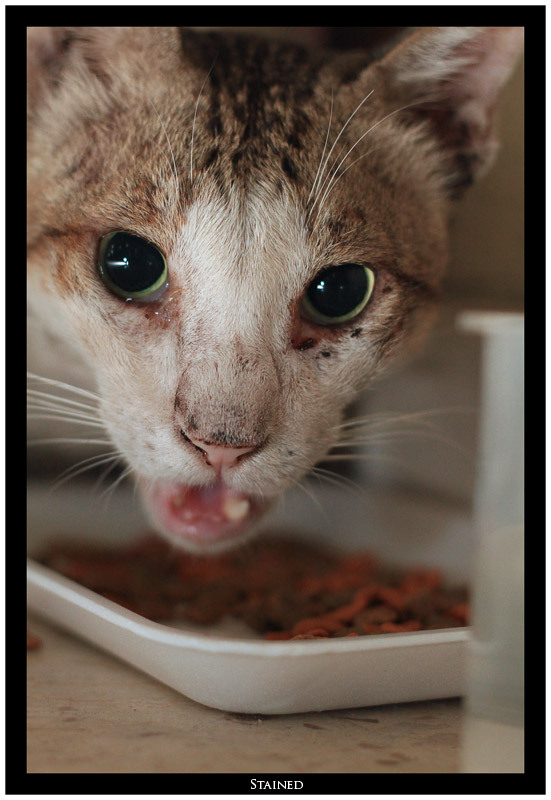 He had been castrated/neutered which meant he was a house cat, either abandoned by someone or he was just lost. Spotted him around my house in September; he looked cleaner than the rest of the lot, a lot stronger as well. I knew he was a house cat immediately cause his ear was clipped which is always a sign of a castrated cat. Well initially I thought he was a female but anyway, I’ve been feeding him on a daily basis since then. He had become the third cat of our house and we wished we could take him in but couldn’t as we had two female cats that might not get along with him. He was the friendliest street cat I’ve ever death with and I’ve dealt with a lot of them over the years. He was attached to me and I had gotten used to him. By the beginning of this year, my family had gotten attached to him as well. My sister desperately wanted to take him in. Unfortunately he used to get into a lot of fights with the other male cats in the neighborhood and would get beaten up quite bad. And then for the past month or so, this uber aggressive ginger cat has been roaming around in the neighborhood, has been marking his territory and well, fighting a lot. 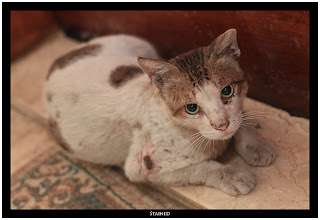 He took a bite out of Jungly’s side a month back and the wound has been refusing to heal. Since then, he’s been spending most of his time outside our door sleeping on the mat. That’s where we’d been feeding him. After being missing for a whole day on Thursday, we found him bruised, bleeding and limping outside our door on Friday. Sister decided to do something about it and contacted Friend of Animals who asked us to get him checked. 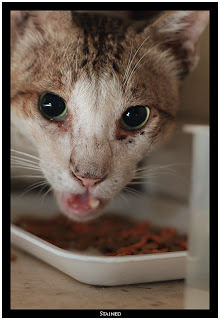 Took him today to Modern veterinary clinic where the first thing they said was they had to check him for FIV. After about 10-15mins, the results were positive and he had to be put to sleep...permanently. 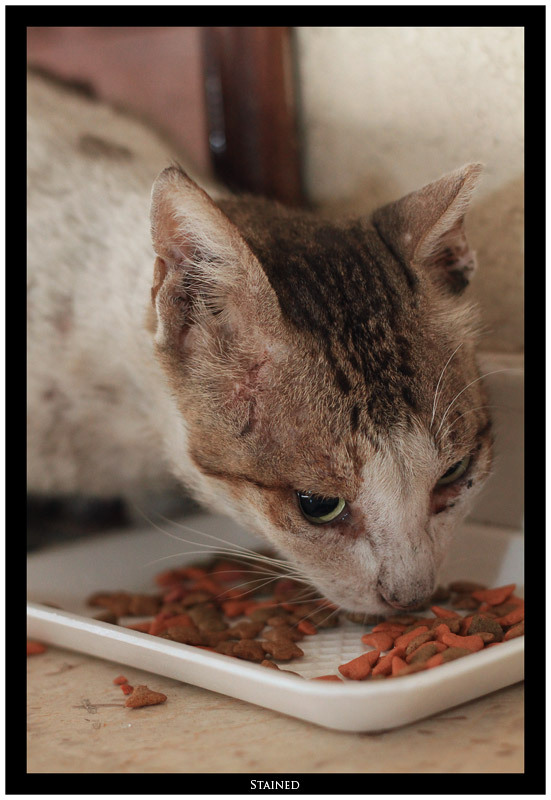 You know what really hurts is that when the veterinarian opened the bag we had used to carry him to the clinic, he popped his head out, looked around and fixed his gaze on me with this innocent look in his eyes wondering where I had brought him. 11 years later, Toy Story 3 still manages to stay true to the original concept and blows us away. Directed by Lee Unkrich (co-director of Toy Story 2), it manages to induce plenty of laughs and few tears from the adults who as kids had drooled over the first two movies. I wouldn’t claim to be a huge Toy Story fan but the third installment just made me realize how much in love with the characters I was. Andy Davis (voiced by John Morris), now 17 years old and heading off to college, needs to decide what he wants to do with the few toys he still holds on to. This predicament leaves him in some angst and in the end decides to take Woody (voiced by Tom Hanks) with him while leaving the rest of the toys in the Attic. But due to various mishaps, all the toys end up in a day care centre called Sunnyside that is run by the huggable, strawberry scented Losto Bear (voiced by Ned Beatty). This is where most of the action takes place i.e. from Buzz Lightyear (voiced by Tim Allen) being reset, Woody leaving the others to go back to Andy, Ken (voiced by Michael Keaten) and Barbie (voiced Jodi Benson) falling in love, being played/tortured by infants, Woody and gang saving the other toys from the evil Losto etc. The process by which the movie builds up is just plain eye candy for us viewers because it makes us fall in love with each of the characters all over again. The opening scenes showing Andy as a kid playing with the toys, takes us back to the original movies which in my opinion was the best way to get the viewers nostalgic and hooked from the start. Even though a lot of the toys/characters from the first two movies didn’t make it to this movie, all the remaining ones were handled in an ideal way making sure we didn’t miss the ones that were lost. Jessie (voiced by Joan Cusack) was the perfect cow girl, Mr & Mr Potato (voiced by Don Rickles and Estelle Harris) head were adorable, Rex (voiced by Wallace Shawn) was his scary best and Slinky Dog (voiced by Blake Clark) the faithful sidekick irrespective of his age. Somewhere in the middle of the movie, I did get slightly bored but as the ending unraveled, the whole thing made complete sense and this is where the movie blew me away. The likelihood of an emotional ending going bad is usually high but the way the writers handled it was just mind bogglingly faultless. I won’t go into details but in all honesty, I’d watch this movie over and over again just for the ending. Loved it...well done Lee Unkrich. As a last minute decision, I decided to attend GeekFest and do a timelapse video. A bit of a personal project as I wanted to see how much motion I would be able to capture if I took a shot every 5 seconds. Ended up taking 1800 shots in 3 hours to make a short 2 minute video. I'm quite pleased with the result though I did make a few mistakes that I plan to fix the next time I do this i.e GeekFest 6.0 I suppose. I also plan to have two cameras to be able to capture the talks as well. Lets see if I manage to do that.